recommended for: Fans of M. Night Shyamalan (e.g. The Village), supernatural stories, something with an old-timey touch, and complex characters. Fans of Ink by Amanda Sun or Hush, Hush by Becca Fitzpatrick. This book took me through a whole spectrum of emotions. As I told Christina, I liked it, then loved it, then hated it....then ended up liking it but having some serious reservations. I can't be completely candid without spoiling it horribly, but I'll try to give my general impression. On the positive side, this book gripped me. Once I got past the early part, I found myself really intrigued by the mysteries in the story. The special "glow" power, the mysterious stranger River, the creepy cavalcade of child vigilantes stalking the cemetery, searching for the Devil. The atmosphere was very old-timey ghost story, which was eerie and spine-chilling and I loved it. I also loved River's character. He's a morally ambiguous vigilante-type and Violet is constantly thrown between loving him and finding him absolutely reprehensible. It was great to see a character so steeped in grey when so many young adult stories stick to black and white. What I didn't like was the villain (who shall remain unidentified), because by this point, it was all black and white. The earlier gray area was gone, and suddenly it was a good vs evil situation that was totally trite and uninteresting. Some of the romantic elements also bugged me. It could have been a great investigation of a narcissistic God Complex, of the dangers of controlling behavior and the ambivalence it can cause girls who get caught with such guys. However, when the book ended, I feel like Violet hadn't really learned anything. She'd gone through such an intense, ambivalent moral struggle, and then totally backslid. In addition, the teenage dialogue was somewhat stilted and the writing style teetered between fascinatingly fresh and totally purple. I ended up enjoying the book, but with a lingering ambivalence that I still can't shake. I knocked off two points because the climax and final villain struggle so deeply ruined the plot for me. The villain was flat, almost straw-man-like, and clearly set up just to make some of the other characters seem more acceptable. I nearly threw the book at the wall. Only it was a traveling ARC, so I controlled myself. Not to mention, Violet's total backslide at the end, which I mentioned already. Which worries me for how girls view these manipulative guys. However, if you slice out the last quarter, the rest of the book was phenomenal. It starts a little slow, but once River arrives, stuff gets real. It's supernatural in the best way, where you aren't sure what's going on for a while. We have devil sightings, Children of the Corn toting stakes in the cemetery, witch hunts, mysteriously-dead drunks, and just general chaos. It's like an M. Night Shyamalan movie without the expectedly unexpected uber-twist, but with all the atmosphere. Gah, I can't even. Tucholke takes such an interesting view of moral ambiguity and the nature of heroism. When is psychopathy successful? When is murder heroism? Where is the line between love and manipulation? And for most of the book, she does a fantastic job of toeing the line between these concepts and drifting in the gray area. Then there's Mr. Meanie McVillain on the scene and all that lovely gray gets shoved pretty hard into black and white. I can't talk too much about it without a spoiler; so leave it that I thought Tucholke copped out to make her hero seem more heroic, when she could have left the reader with some interesting questions. Most of the characters are great. They're obviously caricatured but it goes with the frothiness of the book. It's a little old-timey, a little overly stylized. The characters follow. Violet is a compelling main character. She's smart, independent, and feisty, but she also has some deep vulnerabilities and uncertainties. But she doesn't angst about it. She's a straight shooter and an "old soul." Her brother, Jake, and best friend, Sunshine, start out a little flat and become pretty dense. It's an interesting set-up, with this weird trio of people who don't seem to like each other that much but who hang together from necessity. Then you see more of Jake's and Sunshine's own inner struggles, and the trio makes more sense. There's also a nice cast of side characters, although some of them could have easily been cut. It's a little cutesy, maybe. Kitschy? Small towny? You have to suspend a bit of disbelief. Then comes River. Don't get me started. He has all the potential of a fabulously morally ambiguous character, and in some ways, he sticks true to that. He's manipulative, sneaky, and has a major God complex. He's also conflicted about his role and his power. In this way, his power isn't just some weird super thing like it could be. It's an integral part of his character. It drives who he is. The way his brother, Braeden, watches out for him is so complex, considering River walks a fine line between good and evil. And then there comes Brodie and everything is ruined. I love pretty writing, but Tucholke goes a little too far. In one way, she's beautifully different. She gives Violet a unique voice; Vi sees things, simple things, that others wouldn't notice, like the feel of a barrel of beans running through your hands. It's those nice, concrete, unusual bits that I loved. What I didn't love: the excess. It's effusive, and I use that purply word because I think it demonstrates the problem. Tucholke seems to get caught up in her own prettiness. And I, as a reader, felt tangled in all these strings of metaphors when one or two would do. She has an "and" problem. And all the characters do too, meaning their voices all sound kind of the same. But it didn't make me hate the book, either, so take it with some salt. The pacing really saved the style. It was gushing, but she kept things moving along. Even when I wanted to stomp the book into the ground, I couldn't put it down, because then I'd miss something. It's compelling, and clever, and quick. 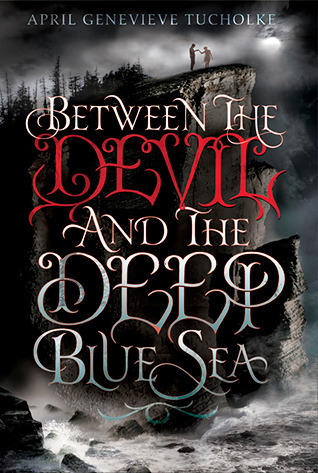 An ornate supernatural story that grapples with the line between good and evil. Thanks for stopping by! I'm hoping the sequel will fix some of the issues I had with the first book. Even though it annoyed me, I still found it really compelling.